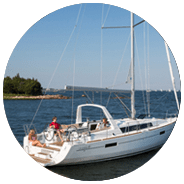 Regardless of whether you own a traditional sailboat, offshore cruiser, club racer, high-tech dinghy or cutting edge racer, our master riggers are ready to help. With easy ordering, guaranteed quality, and fast service, it\'s no wonder that boat owners everywhere turn to us for the rigging they need! Once on-board, our technician will do a comprehensive evaluation of your riggings needs and provide you with an estimate of the work that needs to be performed. Once you’ve approved the estimate, our technician will complete the job quickly and professionally. Our skilled rigging team is committed to completing your job quickly, and efficiently, and always in a professional manner. We set the standard for service and value in the industry and offer competitive pricing. To dispatch a highly trained and dedicated technician to your vessel’s berth on time and ready to take on any task. We are experts in rigging system and have state-of-the-art tools that will allow us to take on any job.